A chestnut New York-bred City Zip colt, who brought $120,000 at the Fasig-Tipton Saratoga sale from Steven Venosa’s SGV Thoroughbreds LLC, more than tripled his market value at Wednesday’s Fasig-Tipton Gulfstream 2-year-old sale when Solis/Litt signed a ticket for $430,000 to seal the deal. The colt, Hip 172, posted a furlong breeze in :10 1/5 in the under tack show (work video). Bred by John Lauriello, he is the second foal from Zia Zia Zia, a winner by Dehere out of a Coronado’s Quest mare. Zia Zia Zia is a half-sister to stakes winner All of Her Twist (Forest Wild Cat), the dam of Oliver Zip (City Zip). The colt’s third dam is a turf stakes winner and stakes producer. After scratches, 10 New York-breds went through the ring and just four changed hands. The bids that did not attain the reserve were robust, in one case as high as $575,000 (Hip 91), suggesting that the connections have high expectations for future sales. 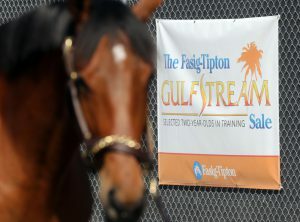 That said, the trio of New York-bred that sold on Wednesday in addition to the City Zip colt – two colts and filly, were well-received, each bringing $150,000. The filly, Hip 141, is a grey/roan individual by Cairo Prince bred by EKQ Stables Corp who breezed a furlong in :10 2/5 (work video). Purchased by Rockingham Ranch from the consignment of Randy Bradshaw, Agent, she is daughter of winner Speightstown Lady (Speightstown) whose dam Bluffing Girl is a multiple stakes winner. Originally sold as a weanling at the Fasig-Tipton New York fall mixed sale for $117,000, she was purchased by Bradshaw at the Fasig-Tipton New York-bred preferred yearling sale for $125,000 last summer. Speightstown Lady has a yearling filly by Effinex and foaled a colt by Overanalyze this year. Hip 115 from the first crop of Competitive Edge who also turned in a :10 2/5 breeze (work video), went to Three Diamonds Farm from Top Line Sales. Bred by Stonegate Stables LLC, the colt was purchased by Top Line last summer for $80,000 at the Fasig-Tipton New York-bred preferred yearling sale. He is the first foal out of winner Salute to Summer, who is a half-sister to a pair of stakes winners, Miss Charm City and Jim’s Prospect, and issues from the family of multiple stakes winner Whereshetoldmetogo. Salute to Summer produced an Outwork filly in 2019 and recently foaled a colt by American Freedom. Acting for an unnamed client, George Weaver was the winning bidder on Hip 137, another colt by Competitive Edge. Bred by W & T Thoroughbred Holdings LLC. The bay colt, who likewise worked in :10 2/5 (work video), is the second foal out of Slamin’ Dixie a multiple winner and half-sister to Conquest Harlanate, the Sovereign Award 2014 champion juvenile filly. He was consigned by Hidden Brook, after being purchased at the Keeneland September yearling sale by Genstar Thoroughbred for $45,000.